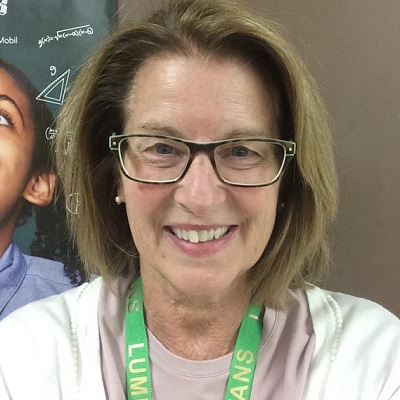 Tell us about yourself as a teacher at Lumen Christi Catholic School. I have been teaching for close to 40 years! 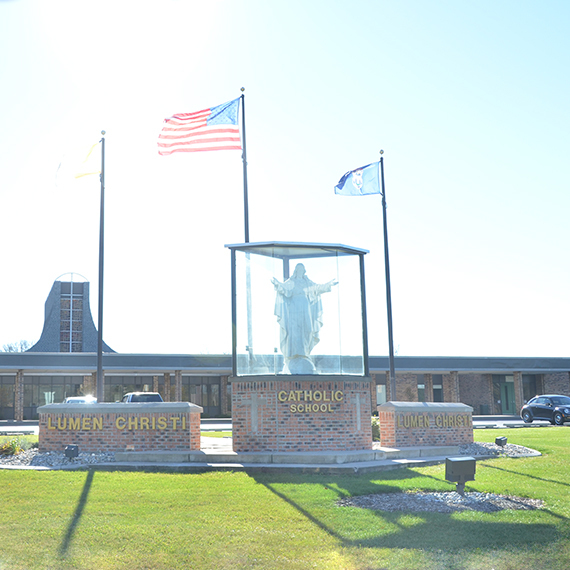 Lumen Christi has been my home and my passion for all of those years. I love my job. People ask me if I am ‘still’ teaching and I tell them that I love getting up in the morning for my job! I love the work and I love the people. Yes. I am still teaching! I teach science this year but I have taught English, Science and Religion over the years. Describe your school. Great students and a warm and welcoming atmosphere. People care about other people- whether it is simply holding the door open for me or by asking, “Are you OK today?” Our student body is INVOLVED! They are involved in extracurricular activities and in our community. I would guess that 90-plus percent are involved in something extracurricular. What drew you to teaching at a Catholic school? Truthfully – I needed a job! But the good Lord was looking out for me by putting me at Lumen Christi. I have been teaching for many years and while things have changed, they have stayed the same. For instance – We are 1:1 iPads. Back in my day, we wrote notes on pieces of paper to our friends during class – and got in trouble for it. In today’s classroom, the students are messaging friends on the iPads – and getting in trouble for it, of course. What is your favorite part about teaching? THE STUDENTS! I love watching them mature and find success. It is so rewarding to see former students in church with their own family and to hear about all of the cool things they are doing with their lives! What are your biggest challenges? THE STUDENTS! Trying to make sure that each and every student finds what he or she is capable of. I know that we, as teachers, only plant seeds. Many of the flowers don’t bloom for years and years. But I want to see some growth while they are in high school. What are your greatest rewards? Seeing the full flower bloom! I love to see that light switch go on in their heads. I love to have someone be excited to come to my class. One of the biggest rewards is having a former student tell me they learned something important in my class or that the college class is easier because of what they learned in class. In your experience, what do Catholic schools do best? Infuse religion into their everyday life. We are not an hour of catechism on Sunday afternoon. We are an 8-hour, interdisciplinary reminder of God is in their life 24/7. Teach the average student to expect more of himself or herself. Students with average abilities as well as those with exceptional abilities will find more discipline to get more out of themselves than they thought possible. What has been your favorite part about being a teacher? Getting to know the students and getting to be a part of their lives. Seeing them grow physically, spiritually and intellectually has been a true gift. I especially enjoy seeing them shine outside of the classroom. Whether it is on a field, a stage, a court, with an instrument or a ball…I love watching them perform. Catholic schools are different because…they are not only trying to help them get into the college of their choice to have the career of their choice and provide them with the tools necessary to have a happy life…..but more importantly…trying to get them into Heaven. That is a hefty goal but one that we are dedicated to!